The UK Government’s action to protect the economy and growth will today help a range of people and sectors across Scotland, including a multi-million pound boost for capital spending. “Against a difficult economic backdrop, we are taking the targeted measures we can afford to get Scotland’s economy moving. “There is a good deal of specific, positive news for Scotland. “The Scottish Government will receive more than £300 million of new money - in addition to the £1 billion it has already received since the Spending Review - all of which it can invest in shovel-ready projects. “Our 2.7 million vehicle owners - particularly those in rural Scotland - will benefit from the decision to cancel the January fuel duty rise. “Business will also benefit, whether from the Annual Investment Allowance increase, a reduction in corporation tax or new allowances for the North Sea oil and gas fields. The news that Perth and Aberdeen are to benefit from UK Government funding for broadband will also help prepare Scotland for the challenges ahead. As a result of decisions in the 2012 Autumn Statement the overall spending power of the Scottish Government will increase by £331m over the Spending Period. The Scottish Government will receive an extra £394m of capital funding over the rest of the Spending Review period (up to 2015). Raising the Personal Allowance to £9440 will help 2.2m people in Scotland and take a further 21,000 low paid Scots (and now 183,000 in total) out of income tax entirely from next April. Cancelling the fuel duty rise planned for January 2013 will help the owners of the 2.7m motor vehicles in Scotland, saving the typical driver £40 a year and a haulier £1,200 a year. Scotland’s 319,000 Small and Medium Enterprises will benefit from a significant increase in the Annual Investment Allowance from £25,000 to £250,000 for two years covering investment in qualifying plant and machinery from January 2013. 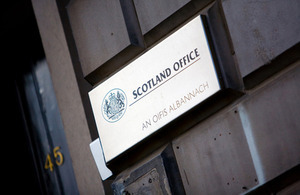 Scottish businesses will benefit from the further one per cent cut in Corporation Tax from 2014 to 21%.